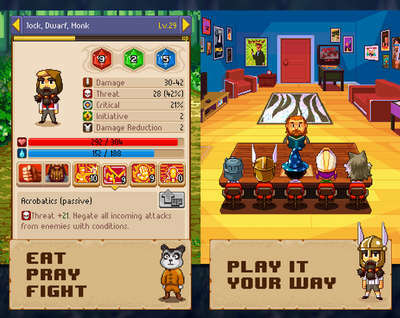 Grab your copy of Knights of Pen & Paper 2 APK v2.0.6 now and play a fun RPG adventure from Paradox Interactive. The game is a humorous turn-based role-playing game that parodies both tabletop RPGs and console RPGs from the 80s and 90s. Play as both the dungeon master and up to five adventurers which must be created by making choices in three different categories (your high-school archetype, character race, and class). Dragons, takes your heroes to the kingdom of Expandria! Travel across land, sea, air – fight your way through caves and on occasion mud in an epic quest. Great new things in Here be Dragons! 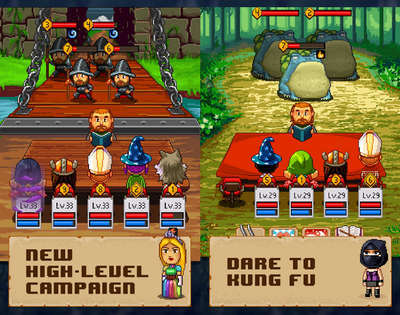 - All-new high-level campaign with Increased skill cap! - New side quests, locations, crafting recipes etc and so forth. - Dragon fights and a Mad King! - The ultimate retro role-playing simulation - again! - Fully customizable party, from the players to the game room. - Expanded equipment and crafting systems. - All-new campaign featuring dozens of locations, sidequests, and dynamic dungeons. Install Apk, Copy ‘com.paradoxplaza.kopp2’ folder to sdcard/Android/obb/ , and play the game!